Sometimes, when we struggle with learning something new (or in this case, something old), we are missing a key piece of the puzzle – some doors are hard to open, but they are surely easier to open when they are unlocked! When I was first trying to learn how to use handsaws, I struggled. Even with a properly sharpened saw (and that was really more of a mental block – it’s not that hard to sharpen a passable saw, but you have to be willing to try!) I struggled to cut to a line. It was very frustrating – one quick cut, followed by a lot of fussing with a plane to try to square up the cut. I was missing something – I just didn’t know what. Off to the books! In Alex Bealer’s Old Ways of Working Wood I found a sketch of a saw bench. It took me a while to find this, as it was in the “bench” chapter and I was of course looking in the “sawing” chapter, as I had no idea that a bench was the key. Slowly it dawned on me, the workbench that I had so painstakingly made, the centerpiece of my shop, was not going to be able to help me saw better. In fact, it was working against me. With a board in the vice, my posture and the angle of the saw to the cut were wrong (at least for a beginner…). I decided to make my own version of the saw bench I had found in Bealer’s book. Click. The door was unlocked! The very first time I used it, my results improved a hundred fold. Soon I was cutting to the line – or even splitting the line, with no planing required (unless I wanted smoother end grain). I found this very, very exciting! It wasn’t, and still isn’t, magic. I need to slow down and pay attention to what my brain, my body, and more importantly, the saw are telling me. But, it was the key I needed. I suppose I may have stuck with it; continued struggling and slowly getting better without the saw bench, but I’m not sure I would have, and I’m glad I didn’t need to. The two primary duties of the saw bench: ripping and crosscutting. Ripping: The length to be ripped off hangs over the right side of the bench as I am right handed. If it is a short rip, I stand at the end of the bench with my right leg on the floor and my left knee bearing on the board. If it is a longer rip, I either stand with my left foot on the floor to the left of the bench and rest my right knee on the board, or I climb up on the bench and kneel on the board with both knees. On occasion, I use the long ripping slot down the center of the bench – usually when the stock is very thin and needs more support. Crosscutting: I stand beside the bench at the right end, and the board to be crosscut projects beyond the end of the bench by the amount that needs cutting. I line up the far edge of the board with the long edge of the bench which gives me a stronger visual sense of squareness. Once I had the bench, many other uses became apparent. Chief among these is the bench is where I do the majority of my boring work. Working with the brace lower allows me to get over the work and increases efficiency and efficacy. And again, my knee becomes the clamp, unless I choose to straddle the work, in which case my rear becomes the clamp. It also works with its larger cousin to support panels or other larger pieces when I need to plane their edges. Additionally, the saw bench gets pressed into service for assembly purposes – at which time the added convenience of the saw bench having the same height as the seat of my shavehorse really pays off. I haven't come across one of these. It looks like it would really be dandy for carpentry type jobs and any pieces of any size. I am going to think about putting one on my "to build" list. I'm glad you found it interesting. If you are using handsaws often, I would highly recommend putting it towards the top of your "to build" list! There are other versions of course (I know Chris Schwarz wrote about his - I looked online but couldn't find it just now...)but I am very partial to mine :) In particular, I like the length. It really comes in handy on longer work. The bench is amazingly versatile, I am constantly finding new uses for it. 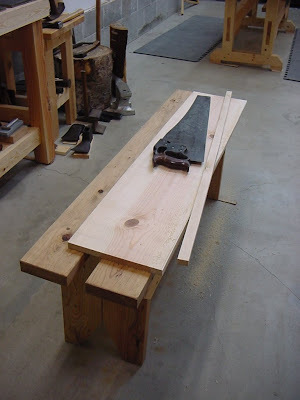 Just this morning I was using it like a giant birdsmouth, cutting very thin stock with a Japanese pull saw – cutting from underneath the rip-slot in the end of the bench. And, in a pinch, you could use it for seating extra guests at the table! Actually, I have plans for Chris Schwarz's saw horse and was tentatively planning to build it after I finish my workbench. Hmm, I just looked at the plans. I had thought that Chris' s sawbench was an entirely different animal than yours, but they resemble each other greatly in function if not in form. Chris' version is a lot shorter than I had assumed it was. In height it is roughly the same as yours. However, the rip slot is much shorter and the overall length of the horse is much less than yours. Thanks for the link Luke. I hadn't seen that version (2008? )- the one I was remembering was a lot boxier. I really like the look of the new one better - which to some people just doesn't matter, but for me form and function are very connected. (Actually, I have a post coming up in the near future that will discuss my view on this.) I also like the way the two benches/horses (hmm - difference? )stack together - but honestly, mine is in use so often I dedicated some lights to its station and it just lives there. I think you will enjoy whatever you end up building - please post pictures on your blog when it's done. Thanks for the tip. 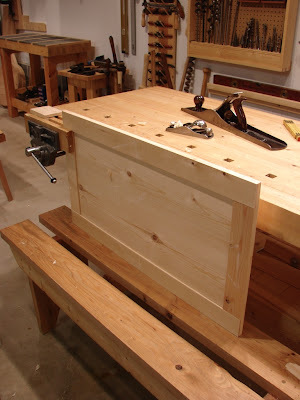 I had been using a taller and wider saw bench with no slot down the middle. I recently made a copy of yours, and I find that it works better. The height gives me the full advantage of gravity, and the slot down the middle makes it effectively very narrow. I can get right on top of the work and saw with ease. I also made a small companion saw bench to support the cut-off when I am cross-cutting. Sam - I am glad you found it helpful. 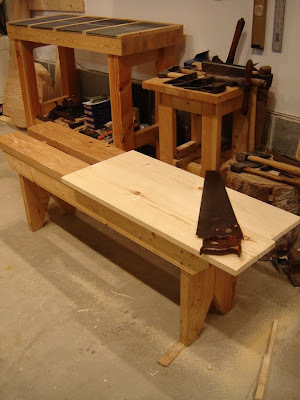 It was really amazing to me what a difference the saw bench made in my woodworking. Thanks for sharing your experience. I was wondering if you would share a couple of things? One, how did you determine the correct height of your saw bench and how long did you make yours? Mine will have to be a little shorter due to space but not much as I think a longer bench is more functional especially for a little guy like me. Bill - The height is based on my height - or more accurately, on the height of my knee from the floor while wearing shoes. I experimented with stacks of wood on a milk crate until I found a height that was comfortable for my left knee to rest on the top while my right leg was in a natural standing position. For me that came out to almost dead on 18". My bench is 54" long - which was a little arbitrary - I think it was based on the stock on hand. I'd definitely advise making it as long as you can - it makes ripping longer boards much easier. Thanks so much for the information, it will be a great help. I also like your use of the wire racks with drawers for storage. I use them for electronics (computers) and my Books. Only in my office as no one else likes them. sigh. I'm going to show them to my wife and see if I can make a set for the Wash room. I like being able to move them around without messing anything else up. The dimensions for my saw bench are 18" high (base this on your knee height), 54" long (could be shorter or longer - in general I think longer is better) and about 13" wide (important for stability as I often climb up on it to saw - a little wider would be even better). In terms of construction, the only thing you probably can't tell from the pictures is that I let the legs into shallow dadoes in the top boards. Hi Dan, I need a saw bench and your design wins. I am a true woodworking neophyte so forgive me if I as a few basic questions, like...how do the the legs connect to each other? Also, what size lumber did you use? Tom - The lumber for the legs and the top is standard 2x6 stock from the Borg. The side pieces are 3/4" stock. To make the legs I edge glued two 2x6's together, then cut both legs to length and then added the vee notches for stability purposes. The top boards have shallow dadoes (approx. 1/4") cut across their undersides which the top of the legs fit into. The dadoes are stopped, that is they do not cross the full width of board - I didn't want them to show on the outside edges. By leaving a gap down the middle, the top overhangs the sides by slightly more than 3/4" - which leaves a tiny, and in my opinion nice, shadow line after the side boards are attached. I assembled this bench with only glue and wooden pegs (3/8" dowels) and it has held up great under some heavy abuse. Of course, you could screw or even just nail it together if you wanted. No forgiveness is needed - ask away! Really. Oh, and your blog has a great title, and looks like it will be very interesting! Dan, great instructions, thanks. One more question if you don't mind. When you edge glued the boards, did you use dowels or biscuits or anything or just good ol' glue? Thanks regarding the blog. In it's infancy. Should be posting something regarding a new saw bench I will build within a month or so! Tom - Just glue. I've never had a problem. I use a jointer plane and get the edges flat and square. Then I test fit until they are perfect (or close to perfect). Use enough glue, but not too much. You should get a nice bead of squeeze out. Too much and the boards will slide all over the place and keeping them even is really hard - although, here's where dowels or biscuts (power tool - just say "No!") would help hold things in alignment. Too little, and you'll starve the joint. With practice I only have to do minimal planing to flatten things up after gluing. In fact, if you look closely at the pictures, you might notice that I didn't even try to hide the fact that the legs are made from two pieces. If memory serves, there was a slight groove from the rounded corners of the boards that I had failed to remove before gluing. I didn't feel like taking the time to plane the surface down to remove it, so I decided to emphasize it my creating a "decorative" vee groove down the middle of each leg. Must have worked, because I have been looking at that thing for years and it doesn't bother me. Dan - got it. This "should" be no problem. Thanks for your help! Pixelsmithy - Thanks. I think I tried various heights and picked the one that was most comfortable in sawing position. Of course, your knee will be resting on top of the wood you are cutting, so you might want to subtract a little to account for that. Hi Dan! Stumbled on your blog while looking for advice on "sawbenches". Great post! Printed it and comments for study as I can get time. John is my 9-year-old, whom I'm trying to teach woodworking. The deal I made with his mother is no power tools until he's at least 16; so I'm getting back into hand tools. Best regards. Zack - Sorry I didn't see your comment - thanks for stopping by. Sounds like you are having a great time with your son - and maybe by the time he's 16 he won't want power tools! Oddly enough, as I looked at your saw bench, a thought occurred to me: Make the center slot a dovetail slot. That way a 'folding wedge' stop black can be added to the bench...slide it where you need it, and drive it home with a mallet. Knock it free in the other direction. 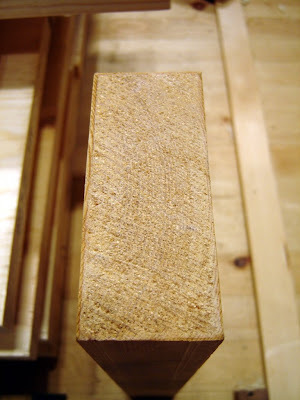 The shape of the block from the end looks like a 'T', but with the base widened to fit the dovetail. I folding wedge-type insert driven in locks it to the table. Anon - I love how ideas just pop up sometimes! Thanks for sharing that one - it never occurred to me. I'm not sure I'd need that, but it's good to have on the "options" list. Dan, I just came upon your site after doing a search for saw bench plans. I like how simple yours appears to be and plan on getting materials in to build a couple. I am new to woodworking, except for 3 years back in Junior High, but we only used power tools then. I thought I would start with power tools, but after reading a few blogs I want to go the hand tool route, as everyone is saying it is cheaper and does not take up the space power tools do. Thanks for sharing you plans. Comment Moderation has been turned on - too much spam! Bummer. I will get an email notification and will approve any appropriate comments ASAP.